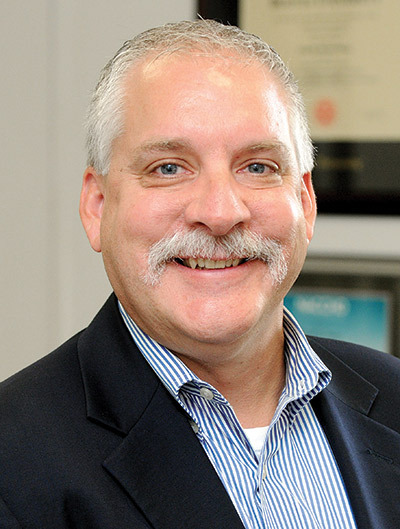 Tim Soucy will become Catholic Medical Center’s director of community health and mission after working for 28 years in the Manchester Health Department|! !| 12 of them as public health director. A Manchester native and lifelong resident of the Queen City, Public Health Director Tim Soucy is going back to where he started 51 years ago. Born Jan. 7, 1967, at Notre Dame Hospital (now Catholic Medical Center) on the city’s West Side, Soucy will retire from the city Health Department on Sept. 1 to take the position of executive director of community health and mission at CMC. A graduate of Manchester West High School, Soucy earned his bachelor of science degree at the University of Vermont and a Master’s in public health from Boston University. He joined the city’s Health Department in 1990 and has been there ever since, serving the last 12 years as department head. After the terrorist attacks of 9/11, Soucy, then administrator of the city’s Public Health Preparedness Program, led the creation of a coordinated plan among police, fire, hospitals, ambulances services and other agencies to deal with natural or man-made disasters. He has formed numerous partnerships with other city departments and outside agencies to address public health issues. Q. Other than inspecting food establishments, what does the city Health Department do? A. We have four main divisions. We have Environmental Health, in which we do inspections at food establishments, healthcare facilities and foster homes. We also do inspections at swimming pools and take water samples. We have a division of Community Health Services, where our nurses run immunization clinics and communicable disease follow-ups and testing for HIV, STD and TB skin tests for folks. We have a Division of School Health – the school nurses work for the Health Department, not the school district. And our fourth division is Chronic Disease Prevention. Our Neighborhood Health Improvement Strategy is built around our effort to have a space-based initiative to improve health. Our biggest location is at the Beech Street School. We also have one at the Gossler Park Elementary School. We offer additional programs to residents of the neighborhood, whether they have children in the school or not. We do some work at the Bakersfield School and Wilson Street neighborhoods and a little on the West Side at Parker Varney Elementary School. We’d love to build it out to cover the entire community, but that will take a little bit of time. Q. After 28 years in the city’s Health Department, including the last 12 as public health director, do you see evidence of progress? Has the state of public health in Manchester improved in that time? A. I certainly believe it has. We’ve seen some success through the years, including a decrease in the rate of childhood lead poisoning. We’ve seen our immunization rates of 1- and 2-year olds increase over many years. and we’ve seen great success in our dental programs by working with a couple of clinics in town, like the Poisson Clinic at Catholic Medical Center and Easterseals. We’ve expanded our school-based oral health program, combined with the community water fluoridation, which occurred in 2000. All have had an impact on the oral health of kids. Q. How has the department itself changed in nearly three decades? A. I think this department has grown tremendously to meet the needs of the community. The role of public health changed after 9/11. We’re now more integrated with hospitals and first responders in the community and that has enabled us to prepare for natural disasters, man-made disasters and acts of terrorism. are based on decisions we make, like smoking, exercise, healthy eating. The focus has shifted a bit from infectious disease prevention to chronic disease prevention. Q. Things like smoking, not eating right, not exercising, don’t result in communicable diseases, so aren’t those matters of personal, rather than public, health? A. Rates of obesity, smoking, heart diseases are all concerns. We realize that the individual decisions we make affect not only the health of the community, but the health of the population. We know that telling someone to stop smoking or eat better is not the most effective way. We’ve tried to create systems of change – having healthy food at the corner store, having green space that people can go out and walk in. We know that if someone has a job, has appropriate housing, has education, employment, transportation, these are things that have either a positive or negative impact on health. Q. You don’t tell people at the corner stores what kind of foods they should sell, do you? A. We received a grant several years ago from the Foundation for Healthy Eating and Active Living and were able to provide funding for stores to add shelves for fresh fruits and vegetables. We tend to do a lot of partnerships, which is one of our strengths. We’ve worked with NeighborWorks to do some financial literacy classes, so folks know how to save their money and potentially save for a house. We’ve partnered with the YMCA to do some Zumba classes. We’ve partnered with the NH Food Bank to help teach healthy cooking classes. We tend to have our hands in a lot of things. Q. How many employees does the department have? A. About 60. It’s gone up and down over the years as we’ve tried to change to meet the needs of the community. When I started, every baby born in the city got a visit from a public health nurse. We’re now trying to expand our home visits. We’re trying to visit high-risk moms. We’re looking at the opioid epidemic and looking at what we’re doing to help new moms. Q. What is the biggest public health problem facing the city and state today? A. Definitely in the city we struggle with the number of children living in poverty, and that seems to increase a little every year. When we look at the link between poverty and poor health outcomes, we begin to say, “What do we need to do differently?” I think then we get into the concept of the Neighborhood Health Improvement Strategy. It’s a shift from very traditional public health to more transformational public health work. Q. What is the Mobile Mental Health Rapid Response Team and what has it been doing? A. It operates through the Mental Health Center of Greater Manchester in conjunction with the Manchester police. They run a crisis line for calls, and a team will come out and do an evaluation of someone who may be in a mental health or substance abuse crisis. They’ve done a couple thousand calls since they were established about a year and half ago. It was designed to take the strain off first responders and emergency rooms. If they intervene in the homes or at a doctor’s office, for example, then you’re able to get someone linked up to care and treatment right away. Q. What has been the biggest crisis you faced in your years in the department? A. I think we’ve become adaptable in dealing infectious diseases. We’ve had to deal with SARS (severe acute respiratory syndrome), with influenza, a whole new strain, and a whole new level of (emergency) preparedness anxiety. I think we’ve become pretty good at being able to adapt quickly to a changing environment. Q. What special problems do the warm weather months pose? A. During summer months we trap mosquitoes to test for the West Nile virus or EEE (Eastern Equine Encephalitis). If we discover a positive result in a batch, it’s a good opportunity for education about mosquito bites and mosquito breeding and whether or where there’s a need to spray. We encourage people to wear long sleeve shirts and long pants or use manufactured repellents. Q. What public health issues does homelessness in the city present? A. It’s a continuing problem. We run a Healthcare for the Homeless Program in partnership with Catholic Medical Center. The city is a recipient of federal health care for the homeless dollars and we contract for the provision of medical care. The concept of health equity, that everyone should have the same opportunity for health, is one that we embrace. Q. What sparked your interest in public health as a career? A. When I got my undergraduate degree in science, I took an entry-level job as a health inspector in the city. It gave me the opportunity to use my science background in the public health arena, and I fell in love with it after that. In my younger days, I wanted to be an emergency room physician. This is much better. It’s really given me the opportunity of being in the community and to form partnerships that are beneficial to the community. Q. What’s the most important thing you learned that you can bring to your new job? A. I think it’s the power of collaborating. It isn’t one person or one entity that can go it alone in this community. I think when we work together we’re better for it.